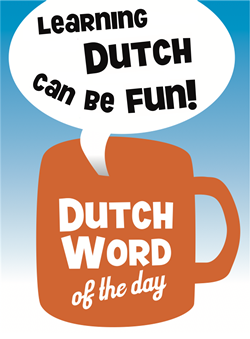 This week’s phrase is actually an expression: “krap bij kas zitten”: to be short of cash/money. It’s an example of the versatile use of the verb ‘zitten’ which normally translates as ‘to sit’ but is also often used when you are ‘in a specific situation’. The adjective ‘krap’ means ‘tight, narrow’. ‘Kas’ is the general ‘(directly accessible) repository for money’. The opposite expression is “goed bij kas zijn/zitten”. – “Geen cent te makken hebben”: to be very poor, to (always) be short of money. – Krap: tight, narrow [adjective]. – Kas: general repository for money which is directly accessible [noun] [de kas, <no plural>]. – Blut: broke, skint [adjective]. This entry was posted in Dutch phrase of the week, DWOTD 1.0, Vocabulary Intermediate and tagged kas, krap, krap bij kas, krap bij kas zitten by Sander. Bookmark the permalink. I recognize ‘pecunia’ in there. Which I think comes from Latin ‘pecus’ (or something) which in its turn means ‘cow’ I believe (but perhaps I’m wrong). I’m glad we moved to coins (I’m personally fine with living a ‘cowless’ life alhough I will miss the cheese of course 😉 ). Well, Sander, you can always go vegan like me, not a cowless life but a cow-friendly life!